Horse balm represents a product whose operation has a revitalizing effect. Although it bears the name of this animal it really has nothing to do with it. It really should not be a concern, considering that this is a very useful medicinal product. Its application is broad and confined solely to exterior use. Most importantly, it can be purchased at most pharmacies. It is best to get the original packaging from the German manufacturer. In particular you are advised to use it if you are an athlete. He is an unequalled when it comes injuries. But there are many other applications. Below we tell you more about horse balm, and how to use it. As we said, this product is named after this animal, but has no correlation with it. People often come in misleading because of it. They do not really know that the horse balm is made from horse chestnut, which is extremely helpful and healing. This product is essentially a gel and does not contain parabens, which is very important. This matter can cause a number of adverse health effects. Furthermore, when it comes to horse balm its composition is extremely healthy. It essentially contains alcohol, water, and castor oil. Besides them, there is horse chestnut, menthol, yarrow, vines, and valerian. We cannot rule out rosemary, chamomile, mint, camphor, mistletoe, hops, dill and arnica. What you definitely need to know is that there are green and red horse balms. The ones that are on sale in pharmacies and they are not made by the original German recipe. However, this certainly does not mean that they are harmful or worse in terms of the effects they achieve. However, all the benefits will be given only by a real Kräuterhof gel. About its effect know in more detail in the following lines. As you may have noticed, in the market there are red and green horse balms. As defined by the colour, their mode of operation is different, and composition. Depending on your needs, you can opt for one of the two and they will be a big help. The red horse balm gives the effect of heating in areas where applied and is quite strong. Should not be used in large quantities. Its characteristics is that it gives the best results. It appeared on the market only after the green horse fat became popular. It differs in that it contains mistletoe, valerian, and sometimes extract of chilli. It has burning sensation and heating. When it comes to red horse fat use is simple. You just rub it on painful areas and gently massage with it. It will be of big help if you struggle with swollen legs and fatigue in them. People with varicose veins are strongly recommended to use it. In addition, horse balm gives a sense of relief and helps with problems such as rheumatism and joint sprains. It helps with sports injuries, muscle spasms and pain. It almost immediately accelerates blood circulation and thus helps to overcome health problems. Green horse balm is somewhat milder than the red one and does not cause a burning sensation or heating effect. Specifically, it provides a cooling effect, which is very comfortable especially if I massaged into the skin. If you need a green horse fat effect it will delight you. It will help if you have suffered a sports injury, you suffer from sciatica, or feel pain in the neck, wrists and shoulders. If you like massage, green horse balm is the right solution for you, because with it you can treat the whole body. It will relax the body in the best possible way and give a feeling of comfort. It is particularly effective against broken capillaries on my feet, because it improves circulation. The elderly population particularly appreciate this preparation. Green horse balm for joints is something that greatly helps in relieving symptoms. However, this type of product is highly regarded and well-known among the female population. Its effects will introduced in the following lines. The appearance of cellulite, especially after winter, is a common problem for many women. It occurs as a result of less physical activity and increased food intake. It is noticeable on hips, abdomen, thighs, buttocks and forearms. Although it is a normal thing, it can be a big problem, especially in the aesthetic sense. For this application the best to use is horse balm against cellulite. Kräuterhof is extremely effective and gives excellent results. It affects the acceleration of circulation in areas in which it is applied. Simply rub it and rub the place where it is necessary to remove cellulite. You will feel the horse balm gradually heat the surface of the skin, which will slightly turn red. Do not be surprised by its function. Prepare yourself for the possibility of a slight tingling, which is quite normal. It is recommended that this treatment be avoided before bedtime, especially if you have a problem with warming effect. Horse balm against cellulite, apply at least half an hour before going to bed. Give it a good massage, to make it better absorbed by the skin. It is advised to wash hands after each treatment, as remnants of the gel does not come in contact with eyes. 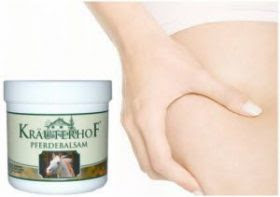 Horse balm for cellulite fat gives effects after a few days. The balm through accelerated circulation eliminates the excess fat under the skin. If you are interested in horse balm experiences of other people you will certainly even more be convinced in its efficiency. Given that it is not an expensive product, it is easily available and fits in everyone's household budget. It is a product you have to have in your home. When it comes to horse balm the price is very favourable, and most importantly, it can be bought everywhere. It is available in almost all pharmacies, as well as the individual boutiques. On average, the package costs about 3 dollars, depending on the size and quantity of the packaging. If you are looking for a product made according to the original recipe, try to find Kräuterhof horse balm. It is true that German one is far better and more effective. Horse balm during pregnancy can be very helpful for women struggling with leg swelling, and pain in the back. Solves problems with joints and bones. However, pregnancy and the postpartum period is a time when the mother is sensitive and her way of life has a great influence on the child. This is why we advise first consultation and counselling with a doctor. If you choose this medicinal and useful gel, side effects that may occur is something you need to bear in mind. However, horse balm rarely causes side effects. They appear in the form of mild to increased irritation of the skin surface after coming in contact with the product. This is due to an allergy to any of the substances in horse balm. We encourage you to read its composition on the packaging. In addition, if it come into contact with the eyes, it can cause painful irritation. If this happens it is necessary to immediately rinse eyes with water. This product will certainly be very helpful and it should not surprise you that it is present in almost every household. Horse balm is highly beneficial and good.